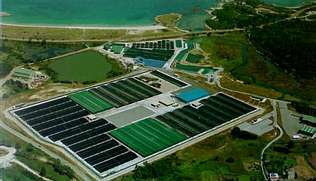 Production of this plant is more than 3500 tons per year, nearly a third of all turbot aquaculture in the world, and my company Pescanova, a gold mine. They eat feed made with wheat and fishmeal and takes about 10 months to reach the height of the market, are sold from 15 euros to 40 euros per kilo in italy, multiply by 7 million fish and look how many sovereigns gold for each sailor, a lucky prize. Want more detailed information yet? R.N. You'll Never Sail Alone! A small question, Susan, if not annoying, can I write to the various topics on the Spanish Navy, ships, seamen, dockyards, etc.? Are the new members have some sort of restriction? Thank you for the summary of turbot farming. It's amazing that they grow so quickly. And, yes, quite profitable! As I said to Caracciolo, please do post information about the Spanish navy. There are no restrictions for new members. You can add to an existing topic or start a new one. I think we would all benefit from it. I know I would. There aren't many books about the Spanish navy in English and I don't read Spanish. So, yes...please! A little blurb of myself, my name known as insurance, is the protagonist of the novel by Patrick O'Brian, but my real name is Alberto Garcia, living in Foz, a small town in northern Spain, and in the work fish farm largest in the world, and therefore the most important site on the planet, at least where there are more big fish, turbot specifically. .... welcome to the forum from me, as well, Alberto. I, too, love the novels of O'Brian, and, also, as Susan, says, I am sure many of us will benefit from your partipation in the forum, along with that of Caracciolo. Em, well, i'll try participate, but i understand english when i read, but to write in english is very hard. Hi, i'll say something about me. It`s a city placed in the North of Africa. From my city i can see perfectly Gibraltar. In the famous battle, the villagers could hear the sound of the guns. I'll show you a photo soon. Hello all. I'm a newbie and still looking around but I thought I would introduce myself. A friend pointed me in your direction and it seems to be a prefect course for me to sail. ...welcome aboard, Bridgid. I am pleased that you joined us. I am sure that you will find much to interest you on this magnificent forum that Susan has built so enthusiastically. Feel free to post when you are ready to do so. My name is Jens and I live in Stockholm, Sweden. I have been reading naval fiction since I was a boy and thus developed a perhaps slightly unsound fascination with all things nautical. While I do read lots of stuff not taking place in the period covered by this forum as well, I have a special interest in the age of sail. As I am soon to be 40 years old I have finally started on my own novel in the genre. It is taking place during the Finnish war of 1808-1809, when Sweden lost Finland to Russia. I am still pretty much in the research phase, though. I actually do write in English (as the market for Swedish nautical fiction is virtually non-existent), so I may bother you about some specific nautical expressions from time to time...if that's OK? Well, when not writing (I do write for a living as well, but other stuff...) I enjoy sailing (now was that a surprise?) my little Alacrity 19 in the Stockholm archipelago. Last edited by jenku on Sun Mar 01, 2009 9:31 am, edited 1 time in total. It's good to hear that you are writing a novel about the Swedish conflict with Russia. I look forward to reading it. I have finally started on my own novel in the genre. It is taking place during the Finnish war of 1808-1809, when Sweden lost Finland to Russia . . . I've only read a little about that, but what I have read was pretty interesting. Hurry up and write it so we can read it! Thanks for the kind welcome! I am sure your expertise will help me writing the book both quicker and more accurate! My name is Panos and I am from Greece. I Write a novel also. It will be in Greek and it is a love story and the begining of the book takes place on board of an Italian frigate of 1850. I will need information about frigates of those times and about believes and superstitions for women on board and general habits of seamen on board. Thank you all in advance. I am very happy already for this "journey" . Re: A Greek on board! Welcome aboard, Panos. I am sure there will be some among our members who will be able to help you.